This page is in group Technology and is a blog note where I will try to describe a WiFi card (that I call PiggyBack WiFi1500 sliceCARD) that is meant to replace another WiFi board (XMOS WiFi sliceCARD) and be a pin plug-in replacement, meant for the two XMOS boards startKIT and xCORE-200 eXplorerKIT. But I will start with its almost native platform, the Adafruit Feather ARM M0 basic proto board, a variant of the Arduino Zero. It’s really a technology move from building on the Texas Instrument’s TI CC3000 IoT platform (that the XMOS WiFi sliceCARD does) to building on the Atmel/Microchip ATWINC1500 platform (that the Adafruit ATWINC1500 WiFi Breakout board does). I will also try to show the process of porting the SW to the multi-core processors on those boards. It would include the standard web server. There is an overview of related notes at “My XMOS notes”, chapter MY OTHER NOTES WHERE XMOS MATTERS. Standard disclaimer, this is just for fun. No money, gifts, ads etc. Also, my non-association with any of the manufacturers and vendors mentioned here. Use “Expand All” (above) to make all folds expanded: visible, searchable and printable! You may want to use Expand All while printing from the browser or while doing text searches. Blog notes leading up to this are newest to oldest: My single-board boards and why notes, My xCORE-200 eXplorerKIT notes (WiFi) and My XMOS notes. I have repeated these links more in the correct context below. 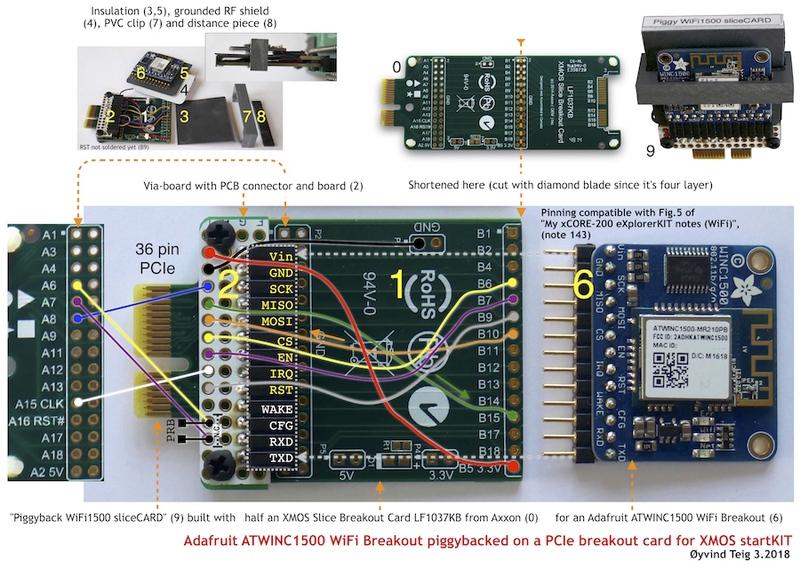 The picture (above) shows how I have now made it ready to try to port the WiFi software using the Adafruit ATWINC1500 WiFi Breakout on three different boards. I have described how I have landed on these three boards in note My single-board boards and why notes. 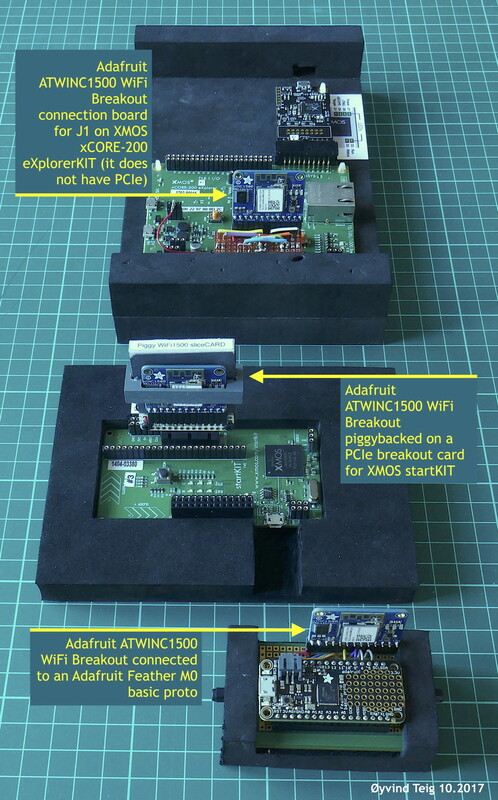 I also have shown the background for why I’m now trying WiFi board in note My xCORE-200 eXplorerKIT notes (WiFi). The Adafruit Feather ARM Cortex-M0+ Basic Proto board (here) I have described somewhat in note My single-board boards and why notes. 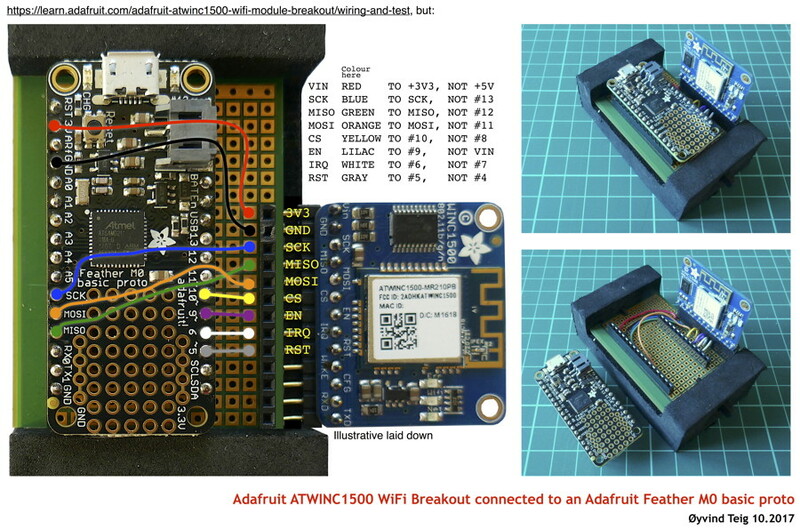 Also the Adafruit ATWINC1500 WiFi Breakout board (here). Aside: If you are interested in how I went on and did the set up for the radio board instead of the WiFi (and not even BLE), then have a look at Fig. 2 of My aquarium’s data radioed through the shelf. …will this install the SPI built-in library? I did som scoping on pin 13 LED output and the suggested pulse code. I tried the <delay(ms); call ms down to the shortest 1 ms and scoped on it with my new USB PicoScope. Disclaimer, again, I mention so much products here, but I still don’t get paid for it, no gift, no nothing! I did need to solder some test pins to connect the scope to, also for the WiFi pins. So the picture of the setup isn’t as clean as seen above any more. After this I tested bootloader mode. I clicked the RST button twice (as described) and the red LED, pin 13 started to soft blink with a PWM (Pulse Width Modulated) signal. It’s nice to view on the scope. The period is 4.524 ms and the thinnest pulse is some μs (but it’s never gone) and the longest is about 1.1 ms. If I trigger on pulse width then 1.119 ms won’t trigger, but 1.072 ms will. I took it out of bootloader mode simply by unplugging the USB cable, and the 200/800 ms pulsing reappeared when I plugged it in again. I run “my” SimpleWebServerWifi_Teig that does its WiFi.setPins as described below. I see that a session, setting the LED on or off, is started by IRQ going low. This starts a session that lasts about 2.3 ms. The IRQ line returns high long before this, after som 140 μs. This SW is different from the XMOS server that polls the wifi module and doesn’t use the IRQ. I will take this from the Adafruit tutorial here. WiFi101 by Arduino Version 0.14.4 INSTALLED. It is described on the Arduino site here. I don’t know when this built-in was loaded. Probably with one of the board support packages? WiFi.setPins(10,6,5); for (CS,IRQ,RST) – NO!.. Below is a scratch pad I am working on to nest on pin usage. The circuit diagram of the Adafruit Feather M0 is here. There is more on these pins at Arduino here. I need to connect them physically and in the code. ====  ADAFRUIT FEATHER M0 (ITS PINS) (SCK,MISO,MOSI) FOR (SCK,MISO,MOSI)               SCK  JP1.6 ATSAMD21G18_QFN.PIN.20 SCK  PB11/I11/SERCOM4.3/I2SC? MOSI JP1.5 ATSAMD21G18_QFN.PIN.19 MOSI PB10/I10/SERCOM4.2/I2SM? Since I got firmware 19.4.4 and the newest is 19.5.2 (above) I need to download and update the firmware. Adafruit has the recipe here. And Arduino has a recipe here. Microchip (formerly Atmel) has all about the ATWINC1500 here. In the Arduino IDE top menu it’s called WiFi101 Firmware Updater, but in the updater’s window they have added the certificates update in the heading. I have not updated the SSL certificates of the WINC1500 yet (here). Now, I’ve already come much further than with the XMOS WiFi sliceCARD that was based on the TI CC3000MOD module that Texas hasn’t updated. And had they done so, XMOS (via TI I presume) wouldn’t have supplied me with any Firmware Updater client like this. (But then, the Updater is part of the WiFi101 library with a small GUI, so it would have come with an extensive enough library.) I have discussed some of this in the notes mentioned at the top. This really was the main reason to go for the ATWINC1500! Not newest anyhow? I see there that the latest version is 19.5.3 (here), probably it indicates that the client doesn’t check this by asking a server. Clinically observed it’s compiled in. Yes it is, in file WiFi101.h there is a define #define WIFI_FIRMWARE_LATEST_MODEL_B "19.5.2". At the Adafruit recipe they say that “If you don’t see the right/matching version you may need to update the IDE”. Sound strange to me. And I don’t know what happens if I replace the #define with “19.5.3”. And don’t even know if the IDE will allow me to build with a (allowed or not) recompiled library. And I want to be sure that I don’t do anything with the firmware that will not take me back again. It depends on the bootloader in the ATWINC1500. I queried about this at the Arduino Forum at WiFi101 Firmware Updater says not latest version. And then pointed to that one from the Adafruit Forum here. This library requires that your board or shield has a matching firmware installed. When the library is updated, also the firmware might be updated, but it is not mandatory. To avoid any issue and ensure that you have the most up to date setup, we suggest that you check your WiFi101 library with the Arduino Software (IDE) Library Manager. There is an option in the Preferences that enables the check for updates of any of the installed libraries at startup. The solution may be as simple as the fact that (as seen in the WiFi101 CHANGELOG) WiFi101 0.14.0 – 2017.03.22 added support for firmware 19.5.2, but up until the the newest WiFi101 0.14.3 – 2017.06.01 there is nothing mentioned about support for 19.5.3. Do I then just lean back and wait until un update message arrives and do what I’m told? Update 17Oct2017: Now, with the KRACK or Key Reinstallation Attack (here) probably leaving the WPA2 implementation also here in need of mending, there probably should be a 19.5.4 or even 20.0.0? But then, this is the client side, I don’t know if the KRACK problem applies here? 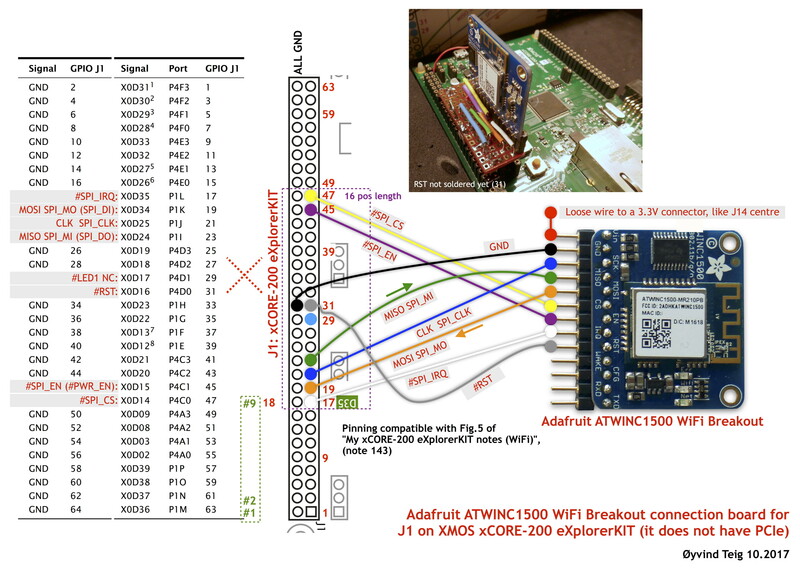 I bought the Adafruit ATWINC1500 WiFi Breakout with on-board (not external) antenna. When I tested the web server the browser hung more than I liked. Messages were lost. I used (1. below) only. I saw that the signal strength ranged from -78 dBm to -67 dBm if I moved the unit up 15 cm. (dBm or decibel-milliwatts (here) is 10 times more watt per 10 dBm. Since it’s negative, the less negative the better signal). When I raise it it seemed to work better with the SimpleWebServerWiFi_Teig. (My XMOS sliceCARD must have been subject to the same limitations, but I don’t know how it saw the signal level. But I did test it right now, good signal level doesn’t help it. TI’s CC3000 is doomed.) The router I used (1. below) was simply too far away. Conclusion: it’s probably not only the signal level, but reflections and other signal transmission properties (like where ground is) that sets the number of retransmissions etc. So, Quality of service (QoS) is more than dBm. Since this started with units (1.) and (3.) above, but only a wifi network on (1.) I decided to get some more decibels. I went down to the shop and fetcthed an Apple Airport Express (standard disclaimer about my mentioning this). Ethernet not connected – Strange text. Nothing connected to the WAN-port. Internet connection missing – saying that it had no IP address . But it did have a LAN IP address! Great! When this was done I created a wireless network on it and did the “network” and “internet” settings so that they would all make sense together. See table above, red text. This causes the Airport Express to be connected to the internet even without the WAN port. This at least works for my internet provider (Canal Digital in Norway), but I hear that these days that many of them don’t allow private wifi networks, routers and DHCP (like GET in Norway). (Standard disclaimer). The LED is on at the start, so it starts with http://192.168.1.15/L to switch it off. The rest should be known by WiFi101-fluent people. I have marked some interesting lines or text bold. I have also coloured some lines blue: SimpleWebServerWiFi_Teig.ino contains loop(). It starts by printing “new client” (when new connection seen) and ends by printing”client disconnected”, but in between characters are read from the WiFi module (if the lower software layer doesn’t add anything of it) and all of that is printed by Serial.write(c); // print it out the serial monitor. Function printWiFiStatus does the initial status print, coloured in green. I wil have to find out why the “Referer:” line seems to be printing the previous message, not the actual. It’s new to me. I run it on a Mac under OS X/macOS. It’s very different from the IAR and AVR IDEs I have mostly used over the previous 15 years. Fair enough! It’s splendidly built so that a starter should not need to fall off. However.. The button “Verify” writes “Compiling sketch…” and “Done compiling.”. I am not allowed to open files from included libraries in the IDE. I tried this from Finder and “Open with” “Arduino.app”. Fair enough, that surely hides them well. And it’s easy to download them from some cloud. Switching from one USB port to the other doesn’t work out of the box. But you do get an error message (or the standard Java fault tree). Do “Tools | Port” and it will have the new port there. Select that one and it downloads again. I can only say that I started with Arduino to get the WiFi board up. It did, very nicely. Now I will see if I could port that SW to the xCORE-200 eXplorerKIT. It has CSP-based concurrency with channels and timers built in (like Go/Golang). The XMOS xCORE-200 eXplorerKIT I have also described somewhat in note My single-board boards and why notes. This board does not have a PCIe connector. The XMOS startKIT board I have also described somewhat in note My single-board boards and why notes. This board has a PCIe connector. And for my aquarium project many of the other I/O pins are used, and I have kept the PCIe not used. I did plan to use the XMOS WiFi sliceCARD, but this project is to try to see if I can replace it with the ATWINC1500-based board instead. The PCIe male board is a XMOS Slice Breakout CARD LF1037KB from Axxon in Canada. It appeared in XCore Exchange post, Any “sliceCARDbreadboard” out there?. But I needed to cut it in two. And I made a via-board with wires, and screwed it to the board with nylon screws. I also insulated the rather long wires from RF field from the antenna with a grounded metallic shield. Made from a used colour pencil box. Update Jan2018: I have now also plugged an Adafruit RFM69HCW Transceiver Radio Breakout 433 MHz RadioFruit, board onto this piggyback board, see My aquarium’s data radioed through the shelf chapter Radio on three boards. Update Mar2018: I updated Fig. 3 (above) with PCIe bus A6 and A7 going to two probe (scope) points only (PRB_INNER and PRB_OUTER). The reason is that the [lib_spi] (that I have had to rewrite some (see, starting My aquarium’s data radioed through the shelf)) needs a CS (chip select) pin that, in the library is coded as a (an array of) 1-bit ports. On the startKIT these are not available on the PCIe, so I had to use a 4-bit port. Observe that a 4-bit port is not an array of a 1-bit port (discused here). I now use all four bits: CS, EN, PRB_INNER and PRB_OUTER, and they are mapped onto the XS1_PORT_4C port. Now this port is parameterised to the [lib_spi] and the spi driver can handle all these pins. Nice to get it to work (CS, EN) and nice for extra scoping (PRB*2).